Barrenjoey Rally 14.7.2013. Photo by Mike O'Flynn, 2013. Community groups have stated this week that what is imperative here is not that you make a high worded articulate submission but that you do send in something. One sentence such as “I do not agree with the commercialisation of Barrenjoey Headland” will do. This week’s Pictorial shares images from the Barrenjoey Rally organised by the Palm Beach and Whale Beach Association and the beautiful scenes around them. On this page we share some key points from those who spoke or sent statements to be read aloud in their absence. Mr Macklin stated “up here we have this magnificent headland which we don’t want touched. It’s a National Park, a listed Heritage area, including the buildings at the top and the buildings at the bottom. It’s listed on the Pittwater Council Environment plan. It has significant aboriginal and cultural heritage. It has significant European heritage. It is the home of two species of protected birds that nest there and is also home to many protected animals. It has no running water, no power, no sewerage. Of late there have been some media reports that have gone off message. We are only interested in the non-commercialisation of Barrenjoey Headland. It is Public land and by law all public land has to have a plan of management. What National Parks NSW is seeking to do here is to change the Plan of Management, to which we are objecting. The wording of these changes, as proposed, will make it possible at some stage in the future for structures like those suggested to be built, even if that does not occur immediately. Some of you may recall that during the 1970’s a Club Med wanted to build right here in Governor Philip Park. Fortunately we managed to get that rolled. When you read what is worded in the proposed amendments it starts to sound like a hotel, an I’m sure that probably won’t happen, but the fact is the possibility will be there when you consider that the State Government, the O’Farrell government, is currently changing the Planning Laws and what you could get here, despite all the safeguards in place because it’s a National Park and a Heritage area, is a combination of all these things. What may happen is that you the community won’t have a say in it at all because it will be over ten million dollars, will be declared a state significant project, and off it will go the Regional Development three man planning panel, and you’re gone. 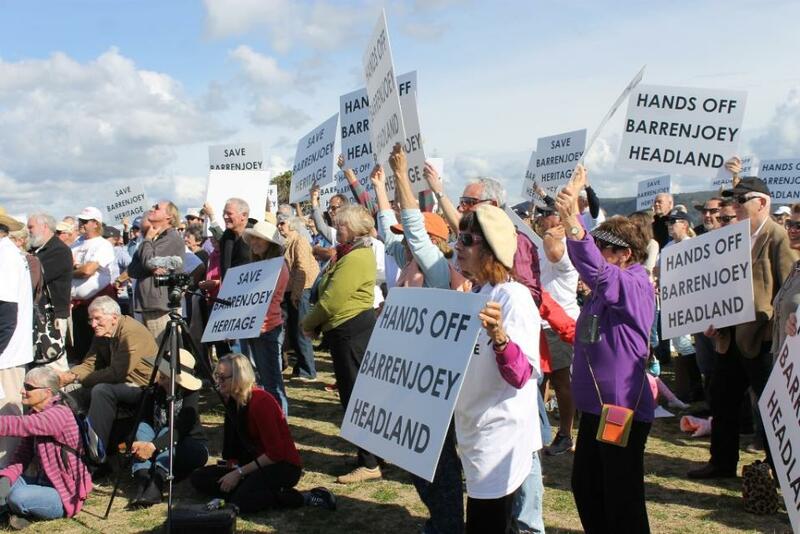 We don’t want commercialisation of Barrenjoey Headland." I am disappointed I am unable to attend this most important rally this morning. I wish to express my strong opposition as your Member for Mackellar to the proposed development of Barrenjoey Headland. Our beautiful pristine coastline is second to none in terms of its combined natural beauty and historically significant buildings, which are the works of colonial architect James Barnet and wonderful examples of late Victorian sandstone architecture and a part of the National Parks estate. The Barrenjoey Headland landscape of natural flora and fauna has remained intact since the lighthouses’ first period of human habitation in 1881. The sandstone cottages and lighthouse itself have remained unpainted and are in their original sandstone finish. To alter or endeavour to capitalise on this site would be a travesty and a misrepresentation of Pittwater’s past. Tourists have an overall sense of history, quiet simplicity and natural beauty when they reach the summit after hiking up Smuggler’s walking track. We must preserve at all costs its historical and environmental integrity and authenticity from commercial enterprise and tourist accommodation. I am committed in joining you in the fight against any proposed development so that we can maintain the very essence of Barrenjoey Headland. I must convey my very strong objections to the amendments on page 8 that state additional buildings may be constructed in the Barrenjoey Headland precinct, especially for commercial purposes. My objections are based on the views expressed to me by members of my local community and also on the basis of a number of legislative instruments. The heritage of Barrenjoey Headland as a light-station and cottages that are emblematic to the local community of Pittwater. These heritage buildings are the oldest surviving structures in Pittwater and thus carry a special significance to the local community. Secondly, I am very concerned that the Heritage values of the site which are recognised by its inclusion in the National Heritage List, the State Heritage Register and the Pittwater LEP may be adversely affected by the construction of new buildings. There are several buildings at Barrenjoey Head that have the potential to be adaptively re-used for visitor and tourist facilities and experiences such as accommodation for visitors and tourists, conferences, functions, restaurants, cafes, kiosks and other food and beverage outlets. It is proposed to investigate such use of the buildings and the potential to lease their use for this purpose. There is also potential for limited construction of new buildings at Barrenjoey Head, in the vicinity of the fishermens’ shacks at the base of the headland or in other visually unobtrusive areas, for the purpose of accommodation for visitors and tourists, conferences, functions, retail (ancillary to visitor facilities and amenities), restaurants, cafes, kiosks and other food and beverage outlets, or other visitor and tourist purposes. Any such development would need to be in accordance with the requirements of the Environmental Planning and Assessment Act and the Heritage Act. There is limited electrical service to the Lighthouse precinct and no mains sewer or water services. A service corridor drilled from the base of the headland to the Lighthouse precinct in 2004 has capacity for conduits for these services but there is currently no service corridor between the base of the headland and the nearest mains connections at Governor Phillip Park. These services would need to be installed to enable accommodation for visitors and tourists and enhance the visitor experience at Barrenjoey Head. Storm Macklin: "...just to refresh your memory; there are two restaurants in Governor Philip Park, there are three kiosks, there are ten other food and drink outlets within five minutes of this park, there are two public facilities in this park; why do we need any more up there?Save Barrenjoey heritage is what I say." First of all, it’s absolutely fantastic that there’s enough community spirit to turn out and make your views known today. It’s really impressive. This is a genuine consultation process; we do not have views on any particular outcome for Barrenjoey except that we want to breathe life into the heritage of the site and look after it. It is not our intention to change the character of Barrenjoey at all. The parts that were read out in the amendments of the plan, all those things are activities that can happen in National Parks, that whole suite of things. But the underlining decision will be that the character of Barrenjoey is not changed. We want to hear from, by all means, what you don’t want but let’s take the opportunity for you to tell us what you would like. Put your submissions in, we want to hear what you want. All we want to see out here is the heritage of the site looked after. It has been our experience, and that it all over New South Wales, that when facilities are actually given a purpose and used, they are looked after much much better then if they’re mothballed. I have brought along some examples of the work that we have done in these coastal heritage sites. You can go on their websites; have a look at Byron, Cape Solitary, Montague Island which are all part of the Light Precincts. If you accept that National Parks are special places, Barrenjoey, as a Lighthouse Precinct steeped in history, is a special place in a special place. So what happens here should look after that and we will be interested to see what you have to say and we’ll take that all into account when we’re moving ahead. Hello Community and than you Tom for coming along. It’s good to see you here and for you to be able to share what you would like to see up here. Twenty one years ago this community fought for this area, it fought to create its own Council, not to govern it but to protect this area. The community fought to put Pittwater Council on the map to protect its natural and built environment and 21 years later here you all still are, fighting for Pittwater. In this 21 years people have not forgotten about our environment and today we’re here to save Barrenjoey’s heritage, to save it from commercial development and commercialisation. To save it from large developers coming in and trying to build something that we do not want. There are plenty of other places where you may construct tourist parks and large buildings suited to commercial tourism but that is not here. One in four people in Pittwater volunteer in some capacity. These dunes, they’re maintained by our community, they are maintained by the residents. We do not want people coming in who are not here looking after it. We have people who have maintained this area by pulling weeds, and created and protected and maintained it. We should not just hand it over and we are not going to hand it over willy nilly for someone to take away and ruin what we have created. Continue your fight Pittwater, continue to save our environment, continue to save our heritage because that is what this is; it is our social heritage, our cultural heritage and we’ve fought for it for 21 years. We’ve stopped casinos going in, we’ve stopped like developments going in, and if we do stop we will have this kind of development in our area. So never stop, never give up the fight. Continue to fight for Pittwater and we will continue to have what we have this generation, what we had for the last generation and what we want to have for the next generation. The moment we stop, it’s all over. So continue the rallies, continue to come out fighting strong and we will have what we want and that is a beautiful, a wonderful, social, heritage, cultural diverse place for us and future generations to enjoy. Continue the fight Pittwater! Our Mayor Jacqueline Townsend made you aware the over 20 years ago 73 % of the people moved that we secede from Warringah. Since then Pittwater has looked after its own, we have fought long and hard, and what do we have now? : we have an area that by and large is a wonderful place to live in. Not only that, this Pittwater Council and you the residents have done much more. The residents of Pittwater came out very strongly against the closure of Mona Vale Hospital and with the help of the Save Mona Vale Hospital Committee, our local Members and Council, but mostly you residents, we have saved Mona Vale Hospital. Unless we had Mona Vale Hospital would be done and dusted now, sold off for medium density housing. The people of Pittwater have done more; we have changed Winnererremy Bay. The government of the day wanted to create medium density housing there, the Council and the people strongly opposed it and what happened; we now have a wonderful parkland. We have fought, we have succeeded. What about Currawong? : Currawong was going to be sold off for commercial enterprise; with you the residents and our local members and Council, we have fought and saved Currawong. Now we have a further thing we have to do; the NSW Government, through the National Parks, has put forward amendments to the Plan of Management for Barrenjoey which seeks to change it. 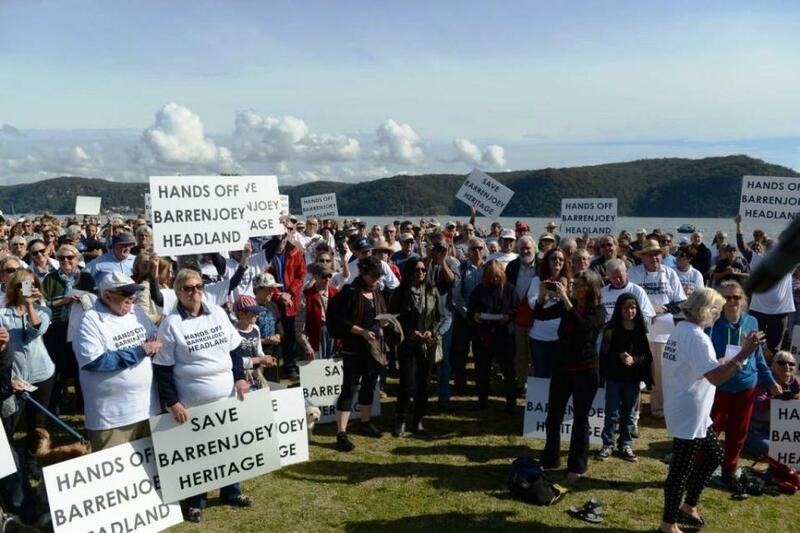 In my opinion we must oppose any commercialisation of Barrenjoey Headland. Barrenjoey headland is a local and state heritage icon. We must protect that. One of the amendments states that the heritage listed fisherman’s shacks be demolished and in their place we could have some other structure; a function centre, conference centre, a restaurant, kiosk or a food and beverage outlet; We don’t want any of that. We want the fisherman’s shack to remain. Barrenjoey Headland is part of our heritage, of Pittwater’s heritage. We have a responsibility to look after this for all the people in the area and for all the people of New South Wales now and in the future. Storm Macklin then invited Harvey Rose to Propose a Motion, which Bryce Ross-Jones seconded while all else attending then raised their hands as a show of being ‘for’. There were no hands raised ‘against’. Motion moved by Harvey Rose (former mayor of Pittwater and Co-Convenor People for Pittwater Community Group). Seconded by Bryce Ross-Jones (life member Palm Beach and Whale Beach Association). *“That this meeting of friends of Barrenjoey demands that the heritage of Barrenjoey Headland be maintained for future generations”. *That this meeting opposes any changes to the plan of management which will allow commercialisation of the headland. Development of function facilities, cafes, restaurants, kiosks, and souvenir shops in the vicinity of the headland must not occur. *That this meeting declares it will support a campaign for as long as it takes to ensure the heritage of Barrenjoey headland is retained. *That this motion be communicated to the relevant Minister, Robyn Parker MP, Premier Barry O’Farrell MP and the National Parks and Wildlife Service. Paul Christie, a member of the Palm Beach and Whale Beach Association and supporter of many local events over decades, had suggested to the committee that one woman, one man and one child have their say on this matter. Prime Minister Pitt who is the prime minister Pittwater was named after is the prime minister who abolished slavery. Part of the Australian Constitution was written right here in Pittwater when an Easter weekend on the Queensland Government steamship Lucinda was spent on our estuary in March 1891. This headland should be left as it is. I’ve lived here all my life, I’m fourth generation Pittwater. My great-grandfather bought here in 1911, he lived in the house that Bob Ellis lives in now. My mother grew up here. It would be a travesty of justice to let this all go without doing something about it. We’ve got to fight to retain this for our children and their children. Let’s not give up. Thank you. We don’t want rubbish all around the headland. We want the animals to live happily in their home. We don’t want the bushland to die. We haven’t really mentioned the Garigal people enough. How we feel today is how they felt when we came and so I would like us all to just take a moment for those people who lost their land. They lost everything so I’d just like to take a moment for us all to think about that. And Hands Off Barrenjoey Headland ! Sydney is one of the great capital cities of the world. It is bordered on the east by ocean, seas and surf. It is bordered on its south by the Royal National Park. It’s bordered in the west by the Blue Mountains National Park. It is bordered in the north by Kuring-gai National Park, what a wonderful setting for a capital city, there is nothing like it anywhere else in the world. Here, on the northern extremity of it, is Barrenjoey Headland in a setting like that, who would want to stuff that up?! So please consider it in this broader context; this is not just important for Pittwater, not just important for Sydney, it is important for the world. We close this record keeping of the Barrenjoey Rally with an appropriate poem read out by one of Pittwater's esteemed orators, Mr. Harvey Rose. The film created by Pittwater Pathway’s John Illingsworth is also embedded below and is another indisputable record of all those who attended this rally and what was said. Community gathers to speak with one voice. AJG Pic. Report by A J Guesdon, 2013. Pictures by Mike O'Flynn, Michael Mannington and A J Guesdon, 2013.